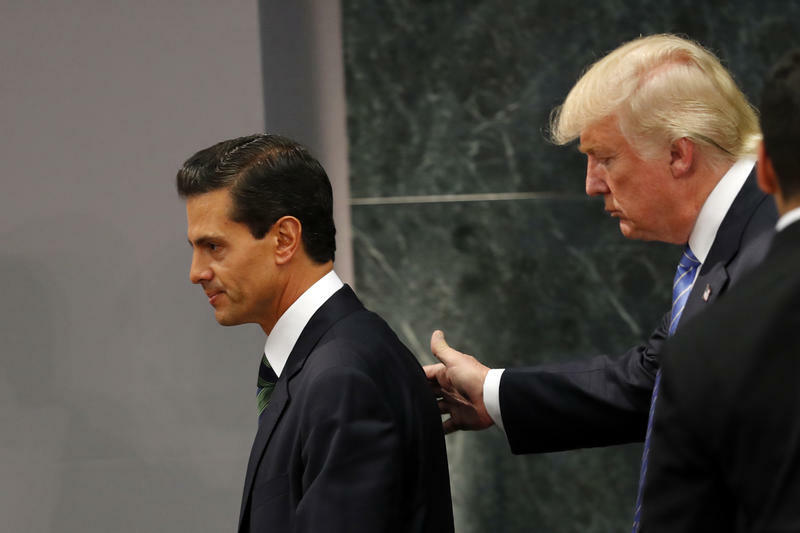 Republican presidential nominee Donald Trump walks with Mexico's President Enrique Pena Nieto at the end of their joint statement at Los Pinos, the presidential official residence, in Mexico City, Wednesday. Kosovo President Atifete Jahjaga (right) welcomes U.S. Secretary of State Hillary Clinton upon her arrival in Kosovo's capital Pristina on Oct. 30, 2012. Listen to the entire Sept. 2, 2016 episode. U.S. involvement in the Middle East is the “turning point in our engagement with the world,” according to Joshua Landis, the director of the Center for Middle East Studies at the University of Oklahoma and the author of the widely read blog Syria Comment. Closer to home, University of Oklahoma Latin America historian Sterling Evans argues Latin America has “been on a back burner for the last few years, and often not even on the stove.” Now the U.S. must observe and react to new agreements between the FARC and the Colombian government, President Dilma Rousseff’s ouster in Brazil, and the ongoing drug trade. Immigration, especially from Mexico, also remains a prominent issue. Along with clearer-cut diplomatic undertakings, the U.S. also must find allies in multi-national issues such as climate change. Regarding global environmental issues. “It'll be interesting to see if we can actually make some positive change in that direction, working together as an international community,” says World Views contributor and OU College of International Studies assistant dean Rebecca Cruise. With Americans looking outward to assess the power and stability of U.S. power, unique challenges in each continent yield different angles on the role - and future - of U.S. engagements. The combination of these dramatic challenges that the Europeans are facing - the immigration crisis, piled on top of economic challenges, and the rising threat, which is perceived differently in different places, the rising threat from Russia - I think that the vote of the British to leave the EU has exacerbated a series of asymmetries between the U.S. perspective and the European perspectives. Therefore, it creates a danger of driving a wedge between U.S. approaches to engaging the world and European approaches to engaging the world. It’s going to grow. In the next 12 years, we're going to add another billion people to the globe. And, as we've seen inequality grow in the United States and in every country, we're seeing it grow in the world, with the poorer countries - particularly in the Middle East and Africa - failing. Big migration, waves, coming out of them. ... And that's going to put tremendous pressure on the developed countries to find a way to accommodate this stream of refugees which does not look like it's going away any time soon. SUZETTE GRILLOT, HOST: This is World Views. I'm Suzette Grillot. This week, KGOU is participating in a national week of conversation, along with other NPR member stations, called A Nation Engaged. We're asking the question: What is America's role in the world? I'm joined by several of our regular contributors, along with a few new voices, and will introduce them as our conversation unfolds. I want to start with you, Joshua Landis, regular contributor here; everybody knows you're a professor of Middle East studies in the College of International Studies. Joshua, we can't not talk about the Middle East. So, what are some of the key actors and principle issues with which the United States is dealing? If our focus is America's role in the world, what has America's role been in what we've seen happen in the Middle East in recent years? GRILLOT: It's like The Godfather all over again. GRILLOT: You try to get away, and you can't. They've been saying that, but really, is this even a reality? I mean, how can we possibly leave the Middle East, given all the interests we have there, and all of the issues that perhaps we've contributed to? LANDIS: Well, that's a dilemma. Now, some people say, well, you've got to allow what used to exist, before the Cold War, which is spheres of influence. And that Russia is going to take places like Ukraine, Syria, and is going to play a dominant role. Iran is going to fill up some of that vacuum as America retreats. Now this, of course, has caused a hue and cry to go up by our allies - Turkey, Saudi Arabia, Israel - who say, feckless leadership-- America has to play a dominant role in the Middle East for stability, peace and so forth. But others are working as hard as they can - Russia, Iran, the Shiites in general, Hezbollah, and so forth - to get us out of certain areas. And the question is, how much money does America want to spend in places like Afghanistan, Iraq, Syria? And that's the dilemma. It's really about the bucks today, because America is becoming a smaller and smaller part of the world in terms of world capital as China, India, and the BRIC countries grow. So how do we maintain our role as hegemon, if you will, in the world, and decrease it without really letting in the dogs of war? GRILLOT: So is the U.S. a stabilizing force, though? You say there are those who say the U.S. has to maintain our allies-- saying the U.S. has to maintain its relationship with the Middle East, but is it stabilizing? Is it not drawing in potentially other actors? LANDIS: Well, we went off on this binge-- we went off on a regime change binge. And that, in a sense-- in a moment of arrogance, after the Cold War, when we thought we could reshape the world, we changed regimes in Afghanistan; in Iraq; we helped the uprising in Syria; Libya, we played a major role; and in Yemen, we're supporting the Saudis to try to beat up the Houthis. So, this has to stabilize. It's added to an Arab Spring-- I mean, the region has been extremely unstable. But America did, in a sense, kick over the anthill, and I think our instinct is just to get the hell out of there-- for a lot of Americans, to say "too many ants, we can't deal with this, it's a violent place, Islam is a very young religion" - it's by far the youngest religion because it's in a part of the world, developing-- 23 years old is the age of the average Muslim. So, at any rate, this is a problem. Americans are increasingly saying, "we can't do it." GRILLOT: Well, there's a spillover effect here too, and so I want to move over to you, Mitchell Smith, associate dean in the College of International Studies, an occasional contributor here on World Views. Mitchell, you're an expert on Europe, and clearly there's a relationship now between what's going on in the Middle East and what's happening in Europe, because obviously the conflict and the crises in the Middle East have led to this massive migration flow into Europe, which is creating a significant problem for many European countries, hitting pretty hard a European Union that is, perhaps, suffering in other ways, still - economically and now politically, in the wake of Great Britain's vote to exit. So, what is your assessment here of the situation in Europe, particularly in light of the United States' role on the European continent? MITCHELL SMITH: I would say this: that the combination of these dramatic challenges that the Europeans are facing - the immigration crisis, piled on top of economic challenges, and the rising threat, which is perceived differently in different places, the rising threat from Russia - I think that the vote of the British to leave the EU has exacerbated a series of asymmetries between the U.S. perspective and the European perspectives. Therefore, it creates a danger of driving a wedge between U.S. approaches to engaging the world and European approaches to engaging the world. It's not clear yet what the effect of the British vote to leave is going to be, but there are many people that are deeply concerned that it's going to exacerbate problems in all of those areas. GRILLOT: Well, clearly, the United States and its European counterparts, European allies, have had a long-standing, very positive relationship, and yet, do we see some division coming again? I mean, you talk about these exaggerated asymmetries, but on the migration issue, on economic and political issues, security in general, around the world, there seems to be, perhaps, more and more distance between the United States and its European friends and partners. Is this the case? SMITH: I'm not sure if it's distance. I think the problems include the following: if we look at issues of, let's say, the threat from Russia-- there has been consistent engagement of the British and the U.S. with the Europeans in the EU to sustain sanctions against the Russian government. Those sanctions were recently extended into 2017. Here's where one of the asymmetries exists: for the Europeans, their trade relationships with Russia are much, much deeper than they are for the United States. It's relatively easy for the United States to portray the Russians solely as an adversary. For the Europeans, they're more of a partner as well as an adversary. And now, what happens with Britain leaving - what are the prospects for the sanctions to be extended further? There's a lot of thought that perhaps this will be the unraveling of the sanctions, with the British out. And that certainly will create something of a gulf between the European perspective and the American perspective. Same thing may be true for intelligence sharing, which-- there's a lot of criticism of that. Not only is intelligence sharing a problem across countries, as we know; it's a problem within countries. We know within Belgium, for example, there have been problems between Belgium and France. So there are limits to this intelligence sharing already. Does British withdrawal make that even more problematic? And the possibility is that it will. We don't know a lot of the answers. 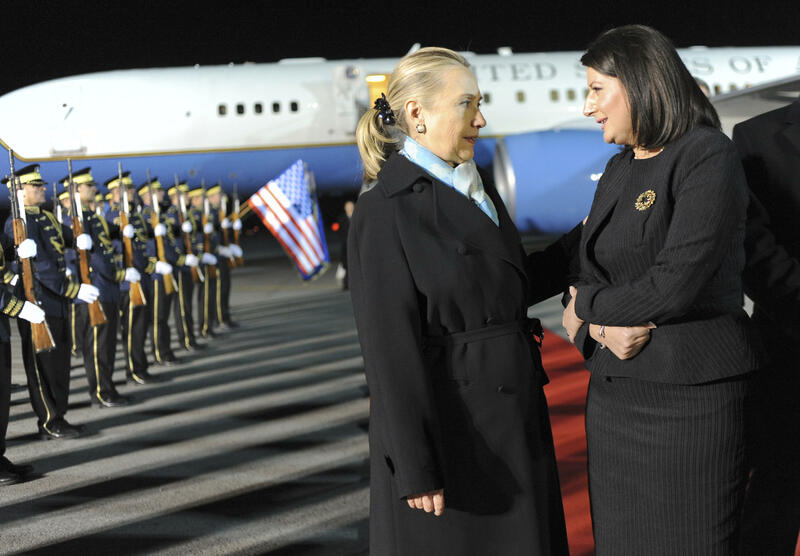 GRILLOT: Well clearly, the U.S. and its European allies-- it's a very special relationship. I think it's been characterized as that in a lot of different ways. It's not always easy, but definitely special, and it's hard to imagine a Europe and a U.S. division. But, there are these continuing and rising issues that might perhaps do it. But let's shift to you, Rebecca - Rebecca Cruise, assistant dean in the College of International Studies, and regular contributor here on World Views. You have the grand assignment today to cover both Asia and Africa for us. The United States has tried - many, many years, President Obama has tried to make this pivot - we refer to it often, that these attempts to pivot to Asia, and yet, as we were talking about earlier with Joshua, the Middle East just keeps sucking us back in. You just can't get away. So that pivot to Asia's never really been fully made, and yet, there are so many issues of great interest to the United States all over Asia, a very large part of the world. So what are the main issues that we need to focus on there, and what exactly is the role of the United States on these issues? REBECCA CRUISE: Yeah, every time we talk about this pivot to Asia, I can't help but think about the "Friends" episode where they're pivoting the couch and "pivot"... But this is something that came about in 2011 when Obama said it was going to be our policy to pivot to Asia, and here we are five, almost six years later, and it's really questionable as to whether that pivot has occurred. There are some that say that it has, in fact occurred; others that have said that even the discussion of it happening has had consequences, and that there may be a response, or the actions we're seeing of China lately are in response to our declaration of pivoting towards Asia. So we've talked on this show about what China is doing. They're increasing their military spending quite a bit. We also are seeing them build islands, if you will - all of these maritime disputes in the South and East China Sea, with a number of their neighbors. They're putting in fill, creating what many would argue are environmental consequences and that has a response from their neighbors. Even just this past month, or actually in July, there was a tribunal at The Hague that in one of these disputes - I think it was the Spratly Islands - that the Philippines were in the right. And China said, "we're going to ignore that," and have continued on their way. So that has been a response, perhaps, to the pivot. We're also seeing a number of these neighbors now look to the United States and become more engaged with the United States because they're looking to us for protection, for economic development, and for other things. So there is that result as well. GRILLOT: So, on this issue of Africa - Africa obviously isn't in the headlines often for us. We don't cover Africa regularly in this country, and usually when it is in the headlines, it's something negative. We could have long conversations about negative coverage of all of these issues but, nonetheless, Africa seems to be one of those parts of the world where the United States is less involved, maybe less engaged, less invested, right? If we go back to the-- obviously, the United States' investment in Europe is clear and longstanding. The United States' investment that continues in the Middle East is huge. Asia, clearly, the longstanding relationships and partnerships, but yet, very troubled relationships that we have there-- but in Africa, what's the scoop? We don't have great partners and allies there, do we? What are some of the key issues, and again, what is the role for the United States in this very large and diverse continent? CRUISE: Well, he hasn't labeled it as a pivot, but President Obama has been pretty vocal in the last year or so about saying that we should focus on Africa. Of course, we're talking about a continent - a very diverse continent, as you say - of about a billion people, and that is likely to double here relatively soon. Joshua already mentioned, when we're talking about the MENA [Middle East and North Africa], that many of these are very young people. So we have a youth bulge, and we know that creates instability. The refugee situation that Joshua and Mitchell have both mentioned - yes, that involves the Middle East, but it also involves countries like Eritrea, South Sudan, Somalia, other areas. So this is a continent that we should be focusing on, and you're absolutely correct that most of our information about the continent is negative. In thinking about terrorist activities, in thinking about health crises, HIV/AIDS, Ebola-- and we are very invested in helping countries deal with those situations. There have been new initiatives by the United States, by the Obama administration, to go even beyond that: to looking at the continent as an economic powerhouse that it could be. There's a great deal of investment that we need to be engaging in. Right now, we're invested in Nigeria because of oil, and some other areas, but there's a lot of opportunity there. And so Obama has come out a couple of times, talking about encouraging Africans to increase their investment with their neighbors, not always to think internationally, but also to encourage U.S. businesses to not only invest in Africa, but to do so responsibly, and to think about how that investment might affect corrupt actions there. So blaming the United States, in some regards, for some of those negative consequences or those negative images that we have, thinking about our role there, and making sure that's a more positive one. GRILLOT: Just as an additional note, it might be interesting to connect your two continents here: to connect Asia, and particularly China, with Africa, because of the Chinese interest and significant investment in Africa, again, perhaps, capitalizing on the fact that many other parts of the world are not engaged so much in Africa. But that maybe will lead us to Latin America. I want to welcome professor Sterling Evans, professor in the history department, and a specialist on Latin America. Thank you for joining us, Sterling. STERLING EVANS: Thank you, Suzette. GRILLOT: So, let's end our kind of around-the-world regional view by looking at Latin America and particularly, as I mentioned, Asia and China in particular, investing in Africa. Another place where they're strongly invested is in Latin America, in recent years. But obviously the U.S. role in Latin America is tremendous, and has been for a long time. I mean, let's go back to the Monroe Doctrine, right? So, I mean, this is our hemisphere - hands off. So give us the lay of the land in terms of what you think are the biggest issues in Latin America and particularly the U.S. role in that part of the world. EVANS: Sure, thank you. It's interesting because it's-- really, Latin America hasn't been on the front focus at all. Latin America's been on a back burner for the last few years, and often not even on the stove. So it's interesting that it would be coming up here as the final continent to discuss too, because other countries have been so very much more pressing. So recently, we just heard last week about the new FARC [Revolutionary Armed Forces of Colombia] agreements with the government of Colombia. And the U.S. role with that would be certainly looking at that. They've been having discussions in Havana, Cuba for 40 years now, and it looks like there's finally going to be, after 50-some years, a peace accord. The United States has been watching that closely, and we give credit to Cuba for offering to host those talks for the last 40 years. Many Colombians have been complaining about how much that has cost the government there and things like that, and not seeing much for it. On our side though, we're going to be watching the drug war part of it. The war on drugs has certainly been key to the Andean countries, especially Colombia, and their role in the cocaine trafficking across the border into the United States. And I think we're going to watch very closely to see if the FARC lives up to its end of the bargain about, "we're not going to be involved with that any longer, we're going to go with some re-training efforts and working with the government." And this does go to a plebiscite in Colombia in the spring, so we'll see how that goes. And I'm sure the United States will be monitoring it very closely. The war on drugs and things like that-- obviously, we're fresh off the Olympics, and Rio de Janeiro. It came across better than a lot of people might think. Certainly, there were problems. Nonetheless, we've been watching that. The Temer government there, a provisional government, while Dilma Rousseff is under impeachment, is also something that we're monitoring. Brazil is now in the worst economic crisis since the Great Depression. People are severely unemployed and underemployed. It's certainly not helping the trade scenario-- a very large trade country, the largest in Latin America. So obviously, we're monitoring things like that too. Cuba is the biggest thing that the Obama administration kind of surprised us with in December of 2014, and we're watching steadily as U.S. relations towards Cuba "normalize," is usually the word used, and that's going to affect tourism, economics, trade, in big ways, with kind of a rapprochement with those two countries. Finally, what I think we hear most often, though, is the hype surrounding the border wall. Certainly, Donald Trump has reminded us about him wanting a bigger wall. It's always very surprising to me, though, because we already have a wall. It was the Secure Fence Act of 2006 that George Bush got through Congress and signed - by the way, that both Barack Obama and Hillary Clinton, as Senators, signed and approved - and funded with a Democratic Congress in '06, to have a wall being built. We already have it. So I don't understand all the hype that he's talking about, and I don't understand why he's not reminding people that Hillary voted for that wall. But that actually brings back the whole immigration question that Josh and Mitch were talking about earlier, because it's that whole idea of: "Are we protecting our borders? Are we having too many foreigners invade our country?" and things like that, from Mexico, from Latin America-- and then that brings in NAFTA, because we've seen a huge, huge increase of people from, especially Mexico, coming during the NAFTA era, not understanding the "push" factors involved with the decline of the economy and free trade that has not led to the economic growth that Mexicans wanted. But now we want to build even a bigger wall, to stop them from coming. It's a dilemma. GRILLOT: Wow. Lots of dilemmas around the world for the United States, clearly. This has been an excellent review of each of your regions. Let's just talk, very briefly, in the few minutes we have left, about some of the topical issues that we might all be facing in terms of the United States' role on things like inequality; environmental degradation; migration, we've talked about; demographics, we've talked about youth bulge and demographics in places like Europe - for example, the aging population is a significant issue; trafficking of other sorts; border crossings, not only of people, but of stuff like drugs, and guns, and counterfeits, and all these types of things. What do you see - again, quickly - in your regions or in your global perspective, even? What are the significant issues that the United States has to deal with from a topical perspective? LANDIS: Well, I think the inequality is central, and it's going to grow. In the next 12 years, we're going to add another billion people to the globe. And, as we've seen inequality grow in the United States and in every country, we're seeing it grow in the world, with the poorer countries - particularly in the Middle East and Africa - failing. Big migration, waves, coming out of them. And we just heard that six years have been taken off the lifespan of a Syrian since the Arab Spring-- but throughout the Middle East, and that inequality of the "winner" countries that are pulling out of poverty like India and China, and other "loser" countries. And that's going to put tremendous pressure on the developed countries to find a way to accommodate this stream of refugees which does not look like it's going away any time soon. And to bring it back to Africa, it's projected that by the end of this century, Africa will have 40 percent of all the people - and that's a lot more than it has today - because it is exploding in terms of population. With weak states, bad government-- one can see a lot of disasters in the future, unless the world comes together to manage this inequality. SMITH: I would add, Suzette, that on a positive side, I think there is still a crucial role for the United States to play in the global economy. That's clear. Joshua talked about diffusion of power, diffusion of influence in the Middle East-- globally, that's clearly going on. That's really sort of a meta-level issue. But nonetheless, if we come back to Europe-- if we look at the role of U.S. investment, for example, in a place like Ireland, there is clearly a positive relationship there in that the Irish financial crisis, which was so devastating to that country, has ended because of things that took place in Ireland. But Ireland's economy has been lifted dramatically by enormous U.S. investment. So there is the potential for a very positive relationship there. However, it is being called into question in the discussions over transatlantic trade and investment partnership-- are being called into question by some of the global reactions to free trade, some of the populism that's emerging in Europe and in the United States. And finally, I would end with this. Joshua raised the question of U.S. spending, and how much we want to spend to extend our influence in the world. I would raise this question: In a world that's as turbulent as it is today, how much does it matter how much we spend? How much can we really make a difference in outcomes around the world? CRUISE: And I'll just add one more thing about the environment. I think that's an issue that we, as a global society, face. We had a historic agreement last year in Paris. It'll be interesting to see if we can actually make some positive change in that direction, working together as an international community. EVANS: Amen. I have to agree with that, and I think most Latin Americanists, or people who study Latin America, would certainly concur. GRILLOT: Thank you all so much for being here today. You've been listening to my conversation with our regular contributors Rebecca Cruise, Joshua Landis, Mitchell Smith, and new contributor Sterling Evans. We've been talking about America's role in the world as part of NPR's weeklong series A Nation Engaged. You can find links to other stories in this project online at KGOU.org. "World Views" is a collaborative partnership between KGOU and OU's College of International Studies. Kaitie Holland prepares our research, Sam Des Prez produces the show, and Audra Brulc prepares our digital content. They're overseen by Brian Hardzinski. I'm Suzette Grillot, and thanks for listening.